Guess what... today is launch day! Queue the fireworks in 3...2...1, blastoff! 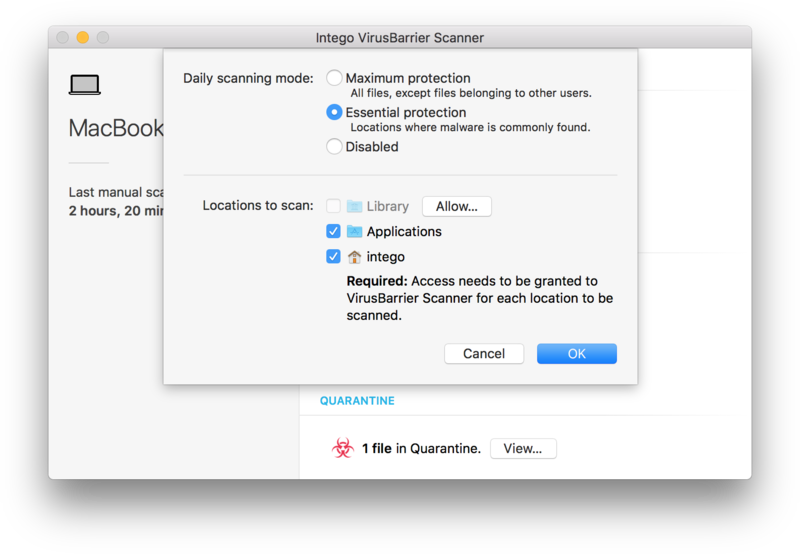 Intego is thrilled to announce the global launch of VirusBarrier Scanner, our all-new free antivirus software for Mac. Available only on the Mac App Store, VirusBarrier Scanner is based on the same antivirus engine found in our award-winning VirusBarrier X9, and quickly searches your Mac to find and eradicate malware and with a light footprint — for free! Simple to use, VirusBarrier Scanner is designed specifically for the Mac App Store. Intego's new free anti-virus software automatically updates virus definitions prior to scanning and can be set to run automatically on a schedule. The software is able to scan your entire computer, critical locations or specific locations on your Mac; if malware is found, you have the option to quarantine or delete the dangerous files. Let's take a closer look at its features below. 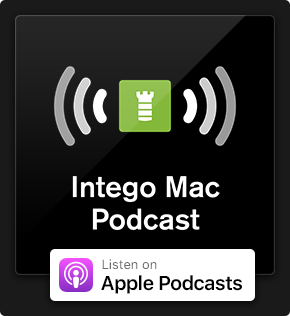 Intego VirusBarrier Scanner allows you to easily scan your Mac on-demand with drag-and-drop, and shields your computer against macOS and Windows malware. You can choose between maximum protection to easily scan all files on your Mac, or essential protection to scan locations where malware is commonly found; additionally, you can manually scan a specific location, such as your personal documents folder. Ready to download now? 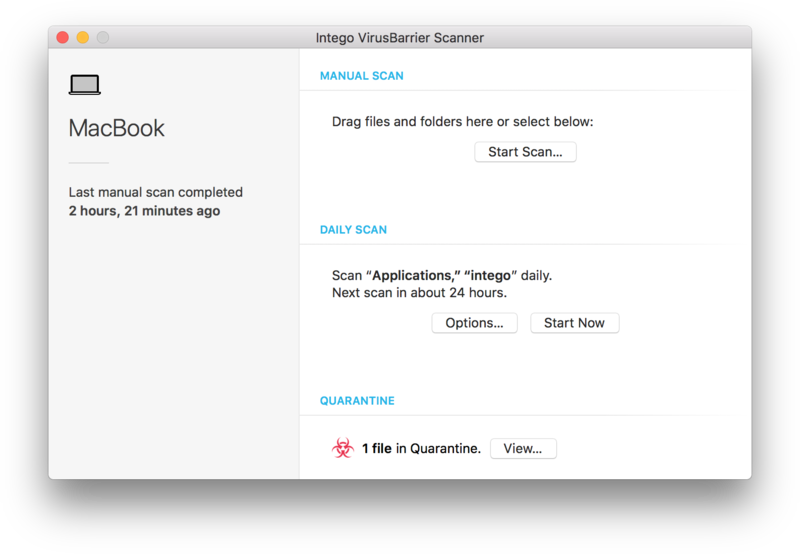 Protect your Mac against malware Intego VirusBarrier Scanner — free anti-virus software. VirusBarrier Scanner offers the same powerful malware detection as VirusBarrier X9, our paid anti-virus software. So you might be asking, how does VirusBarrier Scanner differ from Intego's paid Internet security solutions? Due to sandboxing in the Mac App Store, our free anti-virus app cannot perform real-time malware scanning. It is only able to scan your computer on a periodic basis or when requested by the user. Scanning is limited to locations on your computer to which you grant access — we made it as easy as possible in the user interface for you to do this and be successful! Only our paid Internet security products include a two-way firewall with anti-spyware measures to prevent software on your Mac from connecting surreptitiously to remote servers and stop applications from "phoning home." The firewall informs users whenever a Mac application attempts to send outbound communications from your Mac over the Internet. With our paid anti-virus software, you can choose which applications you want to allow to connect to the Internet and block all others to ensure your privacy. Which Product Should You Get? "I don't care about Mac security." Your safest bet is to unplug your router...and step away from the computer. "I just want to set it and forget it, and I don't want a firewall." VirusBarrier Scanner is the right security software for you. "I want to run real-time malware scanning and prefer layers of protection with a two-way firewall." 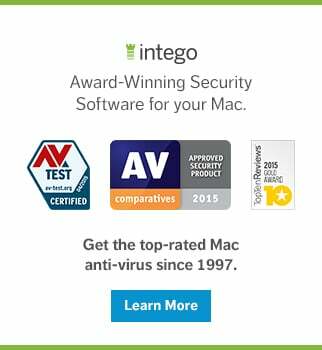 Our award-winning Mac Internet Security X9 is the best solution for you. Enough Already, Where Can I Download It?! Head over to our product page to learn more about VirusBarrier Scanner. If you're ready to download, grab our free anti-virus software from the Mac App Store right now! Give it a try and let us know what you think in the comments below! If you enjoy using our new free app, please rate and review VirusBarrier Scanner on the Mac App Store. 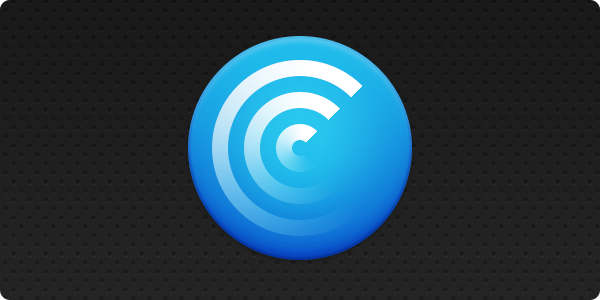 This entry was posted in Intego, Recommended, Software & Apps and tagged antivirus, Free Mac Antivirus, VirusBarrier Scanner. Bookmark the permalink. I’ve been waiting for ages for a light-weight, on-demand anti-malware scanner that do one thing and do it right, as back in the ’90s SCAN.EXE and CLEAN.EXE from McAfee did. I like VirusBarrier Scanner clean interface and the software has all the options any conscious user really needs. And best of all is that the helper file consumes very little resources with a close to zero CPU usage. It is nice to have another free, light-weight, on-demand anti-malware scanner in addition to Malwarebytes for Mac. I actually like the UI of VirusBarrier Scanner better. Plus, it does not constantly remind me to upgrade to the paid version like Malwarebytes does.